Santa Fe Stores captures the essence of the land of enchantment in style, diversity, and creativity. Santa Fe Stores supplies guides, references, recommendations, and insider information. Enjoy the spirit of Santa Fe! We provide the best guide to Santa Fe’s stores and services, unique lists of things to do in Santa Fe, remarkable Santa Fe art and city gifts. Souvenirs celebrate the history of New Mexico with the meanings behind the cities and streets. View historical street names in this first launch of city gifts: Santa Fe t-shirts, magnets, home decor and coffee mugs. 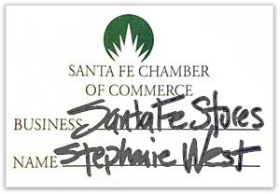 Santa Fe Stores represents a wide variety of businesses which make the Santa Fe experience wonderful. This hand-selected directory averages 14,800 local queries and 18,100 global queries per month. View our traffic stats and join us!